This lease addendum is designed to be executed by the landlord and the tenant when the lease is signed. It allows the tenant to share in the net cash flow from the building which the tenant is leasing. Obviously the tenant has considerable leverage to qualify for a participation in cash flows from the property. This leverage arises from the tenant's lease which provides the security for the financing of the property. The addendum provides that the participation applies only to the original landlord for the property, and the tenant may not enforce the participation against future purchasers of the property in the event it is sold. In such a case, the tenant would share in the proceeds of sale of the property received by the original landlord pursuant to the addendum, but the participation would thereafter cease to exist as against the new owner landlord of the property. Finally, the addendum obligates the tenant to post a letter of credit to secure its performance under the lease. This Lease Addendum (the “Addendum”) is made as of _________________, by and between COMMERCIAL PROPERTY LANDLORD, LLC, a __________________ limited liability company (“Landlord”), and AGREEABLE TENANT, INC., a _________________ corporation (“Tenant”). 1. 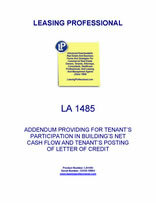 Subject to the terms, conditions and agreements set forth in this Addendum, Landlord shall pay to Tenant a portion of the net cash flow (for purposes of this Addendum, the term "net cash flow" shall be defined as Landlord's actual cash flow from Landlord's operation of the Building [after the Preferred Return, as this term is defined below, has been paid in full to each of Landlord's members] less Landlord's payment of expenses [including debt service] in connection with Landlord's operation of the Building and less Landlord's maintenance of reserves in connection with Landlord's operation of the Building subject to the limitation that any loans from Landlord's members to Landlord shall not bear interest at a rate in excess of the Preferred Return otherwise payable to Landlord's members from the operation of the Building), which payments by Landlord to Tenant, the parties agree, shall constitute an expense of Landlord in the operation of the Building (but which shall not constitute an Operating Expense as set forth in the applicable provisions of this Lease). 2. Unless otherwise approved by Tenant, Landlord's permanent financing for the Building shall contain an amortization based upon a period of not less than twenty-five (25) years. Landlord shall be entitled to determine the payment of all operating expenses and the maintenance of all reserves in connection with Landlord's operation of the Building. Each of Landlord's members has contributed and/or will from time to time contribute cash and/or other equivalent value associated with each such member's investment in its membership interests in Landlord, and otherwise as set forth in the operating agreement of Landlord and the books and records of Landlord maintained in connection therewith (hereinafter the respective contributions by each of Landlord's members are referred to as "Cash Invested"). 3. For purposes of this Addendum, the respective amounts of the Cash Invested for each such member of Landlord shall not be decreased in any respect whatsoever and shall be deemed to be entitled to a twelve percent (12%) per annum preferred interest return ("Preferred Return") as further set forth in this Addendum and shall not be diminished by depreciation, return of capital, or any other accounting event which might otherwise be deemed to decrease the amount of Cash Invested or the capital account of any such member; rather, the aggregate Cash Invested, as the same may be increased from time to time, shall in no event ever be diminished for purposes of this Addendum. Each member of Landlord shall be entitled to the Preferred Return on each such member's Cash Invested from and after the respective times of each increment of such Cash Invested by such member, and after each such member has received such member's total current Preferred Return on any and all Cash Invested, then subject to Landlord's payment of expenses in connection with the Building and the maintenance of normal reserves, as determined by Landlord, the remaining net cash flow shall on an annual basis within sixty (60) days from the expiration of each calendar year, or more frequently if net cash flow is distributed to the members of Landlord more frequently, be divided as follows: Landlord shall pay as an expense of Landlord in its operation of the Building to Tenant thirty percent (30%) of such net cash flow with the remaining seventy percent (70%) of such net cash flow to be distributed to Landlord's members contemporaneously with the payment of such thirty percent (30%) of net cash flow to Tenant. Such payment of thirty percent (30%) of net cash flow from Landlord to Tenant shall continue only for the ffirst ______________ (___) years of the Term of this Lease and shall not continue thereafter. In the event the Building is sold or refinanced during such ______________ (___) years initial Term of this Lease, but not thereafter, then after the Preferred Return is paid to Landlord's members, Tenant shall be entitled to receive as an expense payment from Landlord to Tenant thirty percent (30%) of the remaining net proceeds from any such sale or refinancing (after payment in full of all outstanding security deeds on the premises) with the remaining 70% to be distributed to Landlord's members. At any and all times during all Term of this Lease, Landlord shall be entitled to determine the financing of Landlord (both temporary and permanent) in connection with its acquisition, construction, and operation of the Building, subject only to the restriction that permanent financing shall be based on an amortization period of not less than twenty-five (25) years as set forth above in this Addendum, and further, Landlord shall determine expenses to be paid in connection with the operation of the Building, reserves to be maintained in connection therewith, and the terms of any such sale or refinancing. In no event shall Tenant be entitled to any payment of net cash flow or net proceeds from any sale or refinancing or any other payment under this Addendum after the first ______________ (___) years of the initial Term of this Lease (the "Tenant Participation Period").